The Royal Descendant Hetepheres, about 2440 B.C. Hetepheres was the mother of the pharaoh's hairdresser, Re-Wer, who was honored in a stone tomb at Giza. Carved in high relief from a single slab, this life-size statue of Hetepheres was originally part of a family sculptural group of five figures that included her husband, son, and grandchildren. Her sculpted likeness furnished a recognizable image for her ka, or life essence, to inhabit, should her mummified physical body be destroyed. It also served as a focal point for veneration by her survivors, who would visit the necropolis on feast days. Now headless, Hetepheres stands with her left arm at her side; her right arm was once raised, probably to embrace her grandchild. 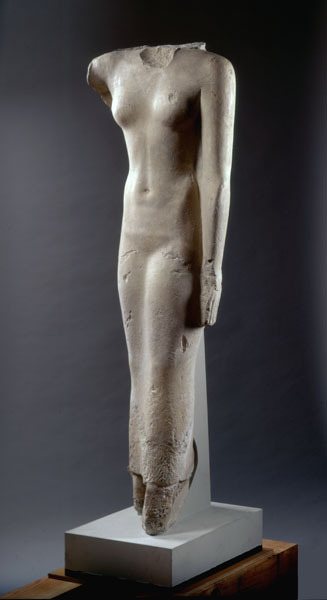 Enlivened by the subtle modeling of swelling breasts, slender waist, and hips revealed beneath a sheer garment, the rigid, artificial pose of the figure- fixed for eternity- is typical of Old Kingdom art.